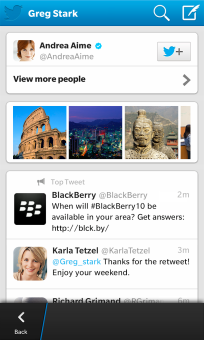 Announce from Blackberry blog that Twitter and LinkedIn for Blackberry 10 apps were updated. The new version includes Universal Search, which offers much more content when carrying out a search through the app. You can see profiles related to search, tweets, images and other relevant results, all on the same page. The content of the columns will be updated automatically without the need for a refresh manually. The new version of LinkedIn for BlackBerry 10 is a new user interface, more fresh, fast and other changes that greatly improve the user experience. The contacts that they have in his book of directions of his Blackberry 10 terminal is now able to import LinkedIn. An important feature is the ability to view information from companies that users follow through LinkedIn. The pages now show how the user is connected to the company, the section on, jobs, similar companies, news and updates. Among other things, also included some improvements in the inbox, deleting and archiving both posts and search people.